On November 5th 1895, U.S. Patent No. 549,160 was awarded to a Rochester attorney named George Selden for what was essentially a gasoline powered car. "...the construction of a road-locomotive propelled by a liquid-hydrocarbon compression type, design of which permits it to be operated in conjunction with the running-gear, so that the capacity of the body of the vehicle can be utilized for the transport of persons or goods..."
That sounds like Mr. Selden invented the automobile as we know it, but he didn't. As HISTORY reports Selden mostly copied the design from something he'd seen at the Philadelphia Centennial Exposition 23 years earlier, and that his patent was actually somewhat vague. 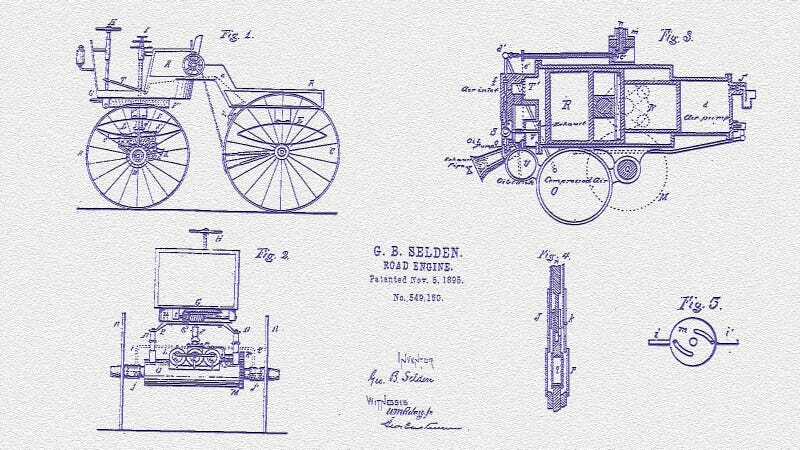 Nevertheless, four years after obtaining the patent, Selden sold it to The Electric Vehicle Company who promptly used it to sue the day's largest automobile manufacturer: Winton Motor Carriage Company. Selden and Electric formed the Association of Licensed Automobile Manufacturers (ALAM) to dig in their heels as monopolizers of liquid-gas-propelled passenger vehicles, planning to sue anyone who tried to bring a similar concepts to market. Unless, of course, they paid dues to the association. ALAM even threatened to sue consumers who bought vehicles from competitors, with advertisements famously quoted as warning— "Don't buy a lawsuit with your new automobile!" Winton settled in 1903, but the year was about to get a lot more interesting for the fledgling auto industry. ALAM found out about Henry Ford's plans to build affordable American cars, and on October 22nd the association filed a patent infringement suit against him. It took until 1909 for a judge to finally decree that any gasoline-powered vehicle was protected by Selden's patent, by which time the Model T had already been on the market for seven months. The trial was appealed and on January 11, 1911 a ruling was finalized that Selden and the ALAM only had rights to the exact design they had patented and others, including Henry Ford, would be allowed sell their own iterations of the gas-powered automobile.